‘Huddle spaces’ has evolved from a buzz word to a requirement in most modern workplaces. We previously discussed what Huddle spaces meant and the rise of the term within the workplace here. So, what’s changed since then? We look ahead to the future of the Huddle space. It could be said that the main force behind the rise of Huddle spaces and places can be directly correlated with the increase in tech-savvy millennials. On the other hand, it would also be valid to argue that the growth of these compact collaborative spaces can be attributed to the rising price of real estate. Whichever way you perceive the upsurge of the huddle trend, one thing is for certain – it is evolving. The future of the huddle space is all about delivering a space that embodies true harmony with quick and convenient usability. As businesses and organisations evolve, greater importance is being placed on standardisation. As huddle spaces continue to become an integral part of every office environment, manufacturers are under increased pressure to deliver a design carrying fuller integration and compatibility with the rest of the office. Nobody wants the main boardroom to operate completely differently to their huddle areas – there is a requirement to have synergy between the two, one space must flow into another. Not only is there a huge demand for huddle-to-huddle connectivity, there is now a developing interest in establishing connectivity with remote locations, partly related to the rise of flexible and home-working. The huddle space is no longer about the collaboration between those sharing the same room but is now progressing towards something which thrives on external connectivity. This is being achieved via the integration of sophisticated video conferencing technology, as well as installing designated PC’s in each and every huddle space, to ensure the necessary technology and software is readily available in every space. Preventing remote participants from feeling like second-class citizens. 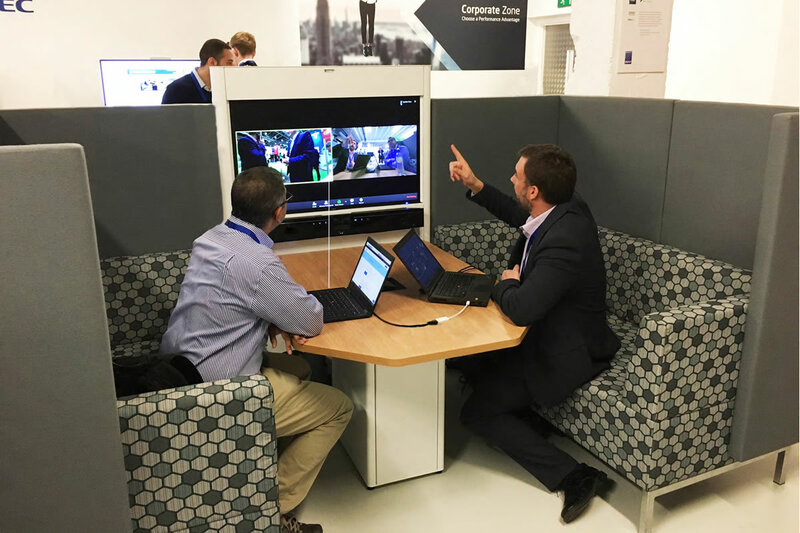 Whether they are in corporate headquarters, local governments or within education – huddle spaces are being recognised as areas that embody ‘transition’. For instance, today manufacturers are starting to install the USB 3.0 ports into huddle spaces to prepare for the near future, even though most laptops today would connect via HDMI. The idea behind this being that as technology continues to evolve at the rapid rate that it is now, collaborative spaces will be able to keep up. Companies are purchasing and installing huddle spaces with future-proofing in mind to ensure their longevity and ultimately usability in the future. As a rising quantity of organisations embraces a more collaborative working environment, the future of ‘huddling’ possesses great potential and arguably unlimited possibility. For more information on how we can help you create your own Huddle space, please get in touch with us today via enquires@dalendesigns.co.uk or call 0121 508 4350.